ProntoFix gives you full transparency, low shrinkage and excellent impregnability in a fast-curing system. The result? Increased quality and speed of your processes. Now you can mount, prepare and analyze your specimens the same day. The advantages of ProntoFix – a high-performance epoxy cold mounting system – include low shrinkage, excellent impregnability and full transparency. Many epoxy systems cure in 8-12 hours, unless they are cured in an oven. ProntoFix gives the same benefits, in a fast-curing system. ProntoFix can cure in as little as 90 minutes* with a peak temperature of approximately 140°C. This means specimens can be mounted, prepared and analyzed the same day. For an overview of all of Struers’ epoxies click here. The ProntoFix system has been developed to meet the high demands of electronics, plasma spray coatings and other delicate specimens. The system consists of a resin and a hardener. It can also be combined with an accelerator to ensure fast curing when using small mounting cup sizes and in low ambient temperatures. In order to find out if the accelerator is recommended, we provide a guide. 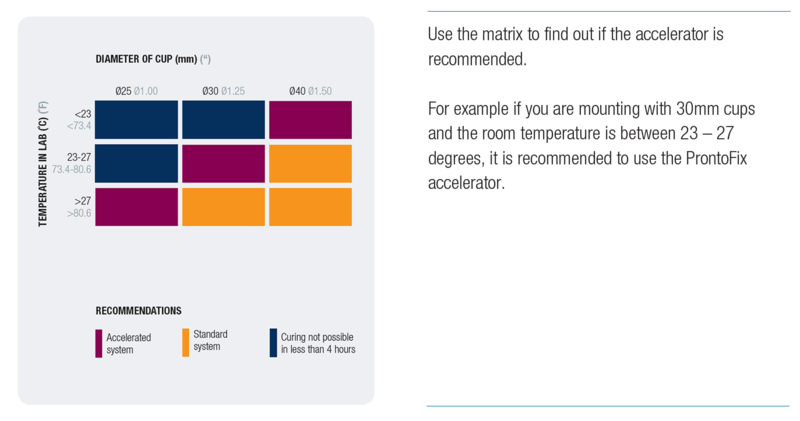 When purchasing the ProntoFix Kit, the Struers System Guide is included, which makes it easy to know if the accelerator is recommended when working in the lab. From low shrinkage to excellent impregnation, ProntoFix gives many benefits. Find out all you need to know about how to use ProntoFix by downloading the ProntoFix Mounting and Trouble Shooting guide here. In addition, you can find the application note for microelectronics here and for thermal spray coatings here. To see Struers’ full range of cold mounting products and accessories, click here. *the exact curing time will depend on the specimen-volume ratio, cup size and ambient temperature.